The IBPS PO common exam 2014 is round the corner & you would be busy in the last leg of preparations.No matter how ready candidates are, there is one question that keeps haunting many.It is - what are the previous years IBPS PO exam cutoffs.Since IBPS written exam marks decide the qualifying status of an individual, it is considered most important. Ever year, atleast 8 – 12 lakh apply for the IBPS PO exam but not more than 80,000 candidates (around 10%) qualify in the common written test. After the common interviews are conducted, only the top 20,000 scorers are able to get appointment in a public sector bank. 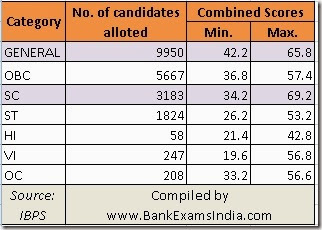 Look at the numbers – 20,000 from a group of 8,00,000.It is very clear that just 3% are able to get bank jobs after cracking the IBPS PO selection process. This not only shows the demand for bank jobs in India but the rising trend of youngsters wanting to become part of the banking sector shunning the IT. Last year, govt. banks had notified 21,680 PO vacancies through IBPS CWE.Based on the combined marks, candidates were given allotment. How Bank Exam Cutoffs are Calculated? Based on the no. of correct answers in each objective test, a corrected score is arrived. Corrected scores are then converted to Equated scores by taking into account the difficulty level of the exam. These final scores are taken as cutoffs. The institute has not revealed the exact formula of converting the original marks into corrected & equated scores. It is not enough for you to secure the above scores in each test.There exists a separate cutoff on total marks as well. After the completion of interviews, the final combined scores are considered for appointment as PO in banks. Candidates should compulsorily achieve both the cutoff marks.They would only then be declared as qualified in the written exam & become eligible to appear for common interviews. The combined scores are for a total of 100, which is a combination of your common exam + interview marks. 2012 Cutoffs: IBPS had a different PO exam pattern in the year 2012 & maximum marks allotted for each section was also different.22415 PO jobs were offered then. For example, the descriptive paper on english has been removed from 2013 CWE onwards.It is also not a part of the upcoming IBPS PO exam 2014. Hence we have not mentioned about the performance of candidates during that year.